40 & # 39 ;: Do not enter: Oseni once again had the opportunity to face the goalkeeper Falkesgaard from Bangkok United, still could not beat his opponent. 34 & # 39 ;: Do not come in. Hung Dung's shot was very dangerous, the goalkeeper of Bangkok had to stop the ball and put the ball on the crossbar. 31 & # 39 ;: Do not come in. Bangkok United team, Anon, scored in the penalty box, but before the end was one more. 29 & # 39 ;: Vander decided to take a shot from a distance and directed the ball to the goal for Hanoi, the ball came out of the goal. 24 ": Bangkok United hit the right and the cross was aimed at Peerapat on the far post, but Van Kien took first place to break the ball before he was fouled. 19 & # 39 ;: No way. Oseni scored a fast goal in Bangkok United and hit the finish line, unfortunately did not manage to avoid the goalkeeper. 16 ": Now the goal was penalized for Hanoi FC. Goalkeeper Bangkok United has been arrested in the net. 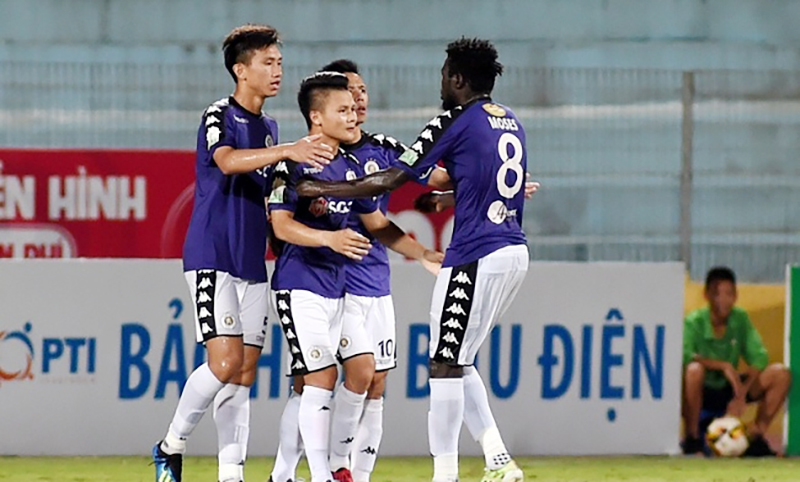 12 & # 39 ;: Still waiting for the unsatisfactory result for Hanoi FC, free kicks from Bangkok Utd created a threat when the goalkeeper Van Conga hit the ball. 10 & # 39 ;: Van Hau received a yellow card after making a mistake on his rival. 8 & # 39 ;: No way. Bangkok Utd recently hit the corner but did not score. 5 ": Omar had a situation in which he tried to give the ball to the goal in Bangkok United, but unfortunately he did not do it well. 3 ": Bangkok United fell in Hanoi FC, the referee said that there was no mistake in this situation. If he passes through Bangkok United, Hanoi FC will play in the last play-off match against Shandong Luneng (China) to compete for the AFC Champions League. This is the club that owns the Man Utd Fellaini support. Fellaini joined Shandong Luneng during the previous winter transfer window. Winning the V-League championship in 2018, but Hanoi FC still needs to play in qualifying to win tickets to the AFC Champions League. The first opponent of Ha Hoi FC is Bangkok United, the best team in Thailand. In the 2018 season Bangkok Utd came in second, just behind the champion of Buriram United. Bangkok United is the owner of the Brazilian coach, Mr. Alexandre Polking. Since the takeover of Bangkok United in 2014, Mr. Polking has helped the team from the top position in the Thai League to reach the top three. On the side of Hanoi, Chu Dinh Nghiem's ​​army was not recognized as an opponent, but his students gained confidence. Duy Manh, Quang Hai, Van Hau and Hung Dung gain self-confidence after taking part in AFF 2018 Cup and Asian Cup 2019. More specifically, Hanoi has an additional quality of staff when he has goalkeeper Bui Tien Dung. The fasteners are the last secure block, the upper players are more confident in opening the ball control and attacking.